A man accused of taking two people hostage during a four-hour siege at a bowling alley has appeared in court. David Clarke, 53, was arrested on Sunday after the stand-off at MFA Bowl in Bermuda Park, Nuneaton. He is charged a number of offences, including false imprisonment and being in possession of a samurai sword and a sawn-off shotgun. Mr Clarke of Ryde Avenue, Nuneaton, was remanded into custody and will appear before Warwick Crown Court next month. Appearing at Warwickshire Justice Centre, Mr Clarke spoke only to confirm his name, age and address. 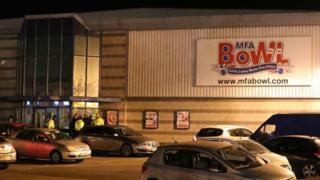 About 40 or 50 people were said to be inside the leisure complex at the time of the incident.